Disabled/Handicap Penalty Fine Signs by Street Sign USA! Posting a penalty fine sign in addition to a handicap parking sign will surely make non-disabled drivers think twice about parking there. 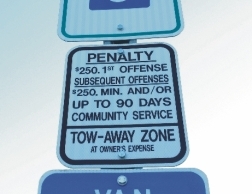 Install a penalty fine sign in accordance with local or state code. Use in conjunction with our line of handicap parking signs.